14th November 2016 – Today XM, one of the fastest growing Forex and CFD Brokers, is proud to announce its partnership with the World’s Fastest Man, 9 Time Olympic Champion and 11 Times World Champion Usain Bolt. Usain Bolt widely recognized under the nickname Lightning Bolt has signed an agreement to become XM’s official brand ambassador for the next 3 years. “From the day of our foundation we have been repeating and arguing that what matters in trading is execution speed. We have put endless resources to build our trading infrastructure to offer the trading speed we have today. “I cannot describe what it means to have the fastest man ever to walk on this planet as our brand ambassador. What I can say is that we as XM feel privileged. XM UK is regulated by the Financial Conduct Authority (705428), XM Australia is licensed by the Australian Securities and Investment Commission (443670) and XM Cyprus is regulated by the Cyprus Securities and Exchange Commission (120/10). Arguably the most naturally gifted athlete the world has ever seen, Usain St Leo Bolt, created history at the 2016 Olympic Games in Rio when he achieved the ‘Triple Triple’, three gold medals at three consecutive Olympic Games. 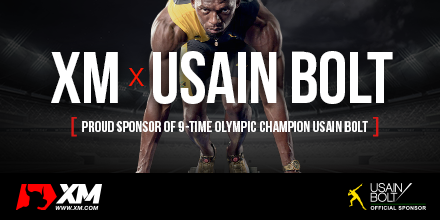 In addition to his 9 Olympic Games gold medals, Usain holds 11 World T&F Championships titles.